Record rental payments and keep track of outstanding balances and payment histories. 123Landlord will automatically know what's due vs what's been collected, and will allow you to run rent roll reports, send rent due letters, and print or email invoices and receipts. 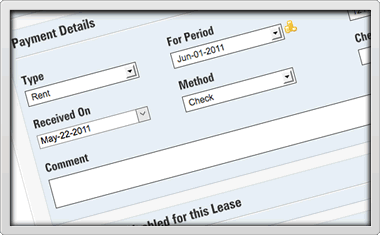 Generate invoices for any outstanding balance - combine multiple receivables per tenant or across multiple properties into one invoice, or split by due date, tenant, etc. Print or email to tenants. 123Landlord automatically calculates and suggests the correct late fees for any late payments, based on the settings for the lease. You can add these charges on the fly when you collect the payment, eliminating separate data entry for the late fee.